Well I’ll be: a new paper in Science (click on reference below; free access with legal Unpaywall app, pdf is here) suggests that the Greenland shark, Somniosus microcephalus, is the longest-living vertebrate known to science. While there are big error bars around age estimates, it’s likely that many live at least 300 years, and some may live up to 500 years! Moreover, females don’t appear to reproduce until they’re about 150 years old. I’m stupefied! The Greenland shark is an apex predator and mostly eats fish. It has never been observed hunting. Recorded fish prey have included smaller sharks, skates, eels, herring, capelin, Arctic char, cod, rosefish, sculpins, lumpfish, wolffish, and flounder. Greenland sharks have also been found with remains of seals, polar bears, horses, moose, and reindeer (in one case an entire reindeer body) in their stomachs. The Greenland shark is known to be a scavenger, and is attracted by the smell of rotting meat in the water. The sharks have frequently been observed gathering around fishing boats. It also scavenges on seals. Although such a large shark could easily consume a human swimmer, the frigid waters it typically inhabits make the likelihood of attacks on humans very low, and no cases of predation on people have been verified. As for its behavior, not much is known, as it’s rarely observed. It hasn’t actually been seen hunting, and nobody knows when and where the offspring are born. Here’s one of the behemoths: they’re about 4-5 meters long and grow only about 1 cm per year, so that already implies that they’re old. (From the paper): Radiocarbon levels (pMC) of different origin (inorganic and dietary) over the past 150 years are shown. Open symbols (connected) reflect radiocarbon in marine carbonates (inorganic carbon source) of surface mixed and deeper waters (26, 36–38). Solid symbols reflect radiocarbon in biogenic archives of dietary origin (11, 14, 22, 24). 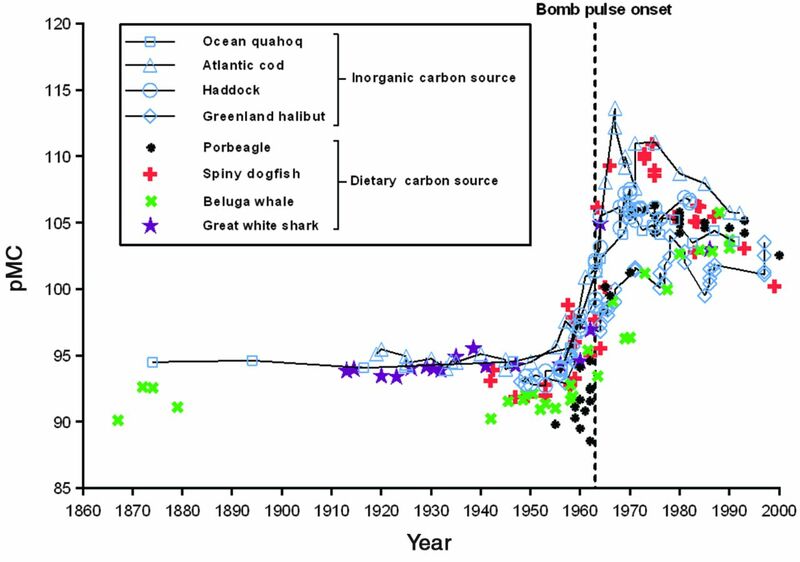 The dashed vertical line indicates the bomb pulse onset in the marine food web in the early 1960s. If a Greenland shark’s eye nuclei showed the high levels of “spike” C-14 attained by the species above, then, it must have been a fetus in the early 1960’s; that is, it must be less than about 60 years old. Without the spike, it must be older than 60 years. But how much older? It turns out that there’s a “Marine13” age curve in which levels of carbon-14, which fluctuate naturally over time, can be correlated with past times by using data from tree rings, corals, plant “macrofossils”, and other carbon-containing materials of known age. That data was used to determine the ages of sharks of various sizes. The age estimates were themselves given error estimates using Bayesian methods, with these limits incorporating estimates about growth rates, size at birth, and age estimates from one shark (#3 in the graph below) that had an intermediate level of C-14 between past background levels and bomb-testing “spike” levels. Old #3 was thus considered to be about 50 years old when it was sampled in 2012. The graph below shows the estimated ages of the 28 sharks with 95.4% Bayesian confidence intervals (shown in dark blue) plotted against the length of each shark, so there are 28 graphs. As expected, the bigger sharks are older. (Ages are given by estimated dates of birth, which go back several hundred years). (From paper): Fig. 3 Bayesian age ranges of prebomb sharks. The estimated year of birth against total length (TL) for prebomb sharks (nos. 4 to 28) is shown. Light blue shows the individual age probability distributions for each shark, and modeled posterior age probability distributions are shown in dark blue. Fixed age distributions (model input) of one newborn shark (42 cm, 2012 ± 1) and of shark no. 3 (220 cm, born in 1963 ± 5) are shown in orange. The red line is the model fit connecting the geometric mean for each posterior age probability distribution. 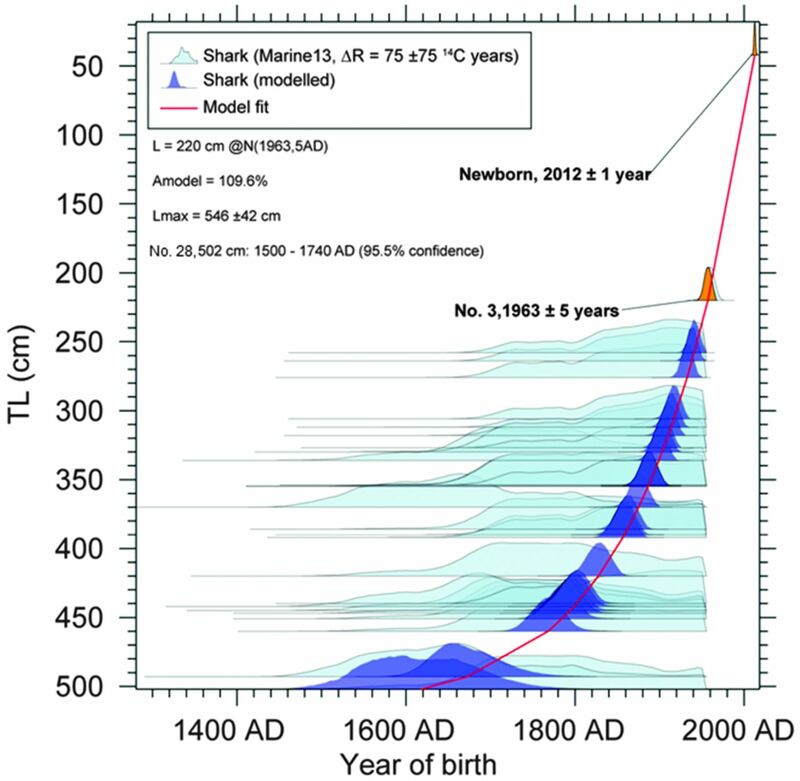 (Inset) The model output; i.e., Amodel, Lmax, and range of birth year for shark no. 28. Also see the supplementary materials. The upshot is that these things can get old: the age estimates (with error limits) of the two biggest sharks were 335 ± 75 years and 393 ± 120 years, which suggests that some sharks could be as much as 500 years old. But we can be confident that the big ones are about 300 years old. Further, because we know that females don’t reproduce until they’re about 4 meters long (this is presumably because no sharks smaller than that have had fetuses),the age of first reproduction would be about 156 ± 22 years. Our results demonstrate that the Greenland shark is among the longest-lived vertebrate species, surpassing even the bowhead whale (Balaena mysticetus, estimated longevity of 211 years). The life expectancy of the Greenland shark is exceeded only by that of the ocean quahog (Arctica islandica, 507 years). Our estimates strongly suggest a precautionary approach to the conservation of the Greenland shark, because they are common bycatch in arctic and subarctic groundfish fisheries and have been subjected to several recent commercial exploitation initiatives. If sharks really can live 500 years, they would have been youngsters when Erasmus was writing and plagues of dancing mania broke out in Europe. This entry was written by whyevolutionistrue and posted on November 15, 2018 at 10:30 am and filed under vertebrates. Bookmark the permalink. Follow any comments here with the RSS feed for this post. Both comments and trackbacks are currently closed. Extraordinary. More unintended consequences of nuclear fallout for forensics purposes. I believe, to a limited degree, both Chernobyl and certainly Fukushima have also provided some details on animal radiation resilience and migration. I thought I’d seen this before…. Sweet Jesus, shoot me now. I neither remembered that post nor looked at the date on the Science paper. Well, a couple of hours shot. At least this will be new to some people . . .
For what it’s worth there are probably more than a few new readers around here since 2016. Besides, I enjoyed reading both posts and am appreciative of the effort you put into the quality content on this site regardless of how many times it appears. I had never seen it before, and found it fascinating and wonderful. Now that you mention it, I *do* recall it from earlier. But I didn’t do so at first; and it’s still remarkable, however many times one comes across it. I guess this is one of the consolations of getting on in years: one finds things wonderful over and over again, however many times one finds out about them! New to me and a good read. I remembered the original, but for some reason thought this one had some different angles. Either way, I enjoyed the post back then and today- thanks. I don’t remember this, Jerry, but I could very well have seen it before; I just don’t remember well these days! Still *loved* the post, and if reaching sexual maturity at age 150 doesn’t bear repeating, then what does, eh?! Great to have you back at the helm, el Capitan! I don’t remember the previous post either. So, I, for one, am glad of the repost. Yes, I hadn’t read the earlier post. It’s not a memory issue; I’ve written nearly twenty thousand posts and I think I can be excused for occasionally repeating something I’d written previously. Indeed. And it’s still a cool posting! Of course. 🙂 Perhaps I’m not good at expressing sentiment though plain text, but my comment was meant in a friendly way. Very interesting. There are many variables to contend with, and the authors certainly did careful consideration of many of them. But one variable is that like cave animals, deep sea animals incorporate more ‘old’ carbon with less 14C. So their 14C levels I think can come out saying that they are older than they really are. There are calibrations and models that can account for the amount of “old” carbon incorporated by marine organisms (and indeed, by shaved, sea-going apes with a shellfish/ seafish rich diet, in comparison with with their “compotriots” (other apes who make pottery in the same styles – it’s a sensitive indicator of contemporaneity. And a deeply awful pun, wot I just made up.) living more than a couple of days from the coast. That aspect is relatively well controlled for. Cave animals, however, are more likely to be more variable. The interaction of atmospheric CO2 with soil acids, the “isotopically old” carbonate of the limestones … highly variable. One of these days, I’m going to use the obvious derivative techniques to create a copy of the Turin Shroud with a “correct” carbon-14 date. But … in Nylon, or Rayon? Or some South American plant-based fibre. Delightful science. Now I’m trying to imagine my mind being stuck inside one of these creatures tooling about the muddy bottom day, after day, after day…for 500 years. Some populations of Greenland sharks are parasitized by the copepod Ommatokoita elongata which destroys the corneal tissue – partial blindness. Not very important in a creature that lives deep & cold mostly. I would suppose their perceptual universe is ruled by the tastes/smells of rotting flesh miles upstream in the inky dark. The Wiki says they travel incredibly slowly, much less than walking speed, so I assume energy balance matters a lot & the brain isn’t that ‘awake’ most of the time. The Mega Mouth shark conjures up images of one Mordacious commenter lurking in these waters of late. Don’t ask me how I recall this, but I heard Steven Chu say human eye proteins are likewise the oldest proteins in human bodies. Fascinating to think back in time like this.